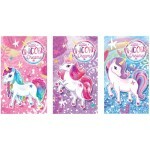 Fun Stationary Notebook – Unicorns. Comes in 3 colourful designs. A small notebook. Each notebo..